What better day is there than Remembrance or ‘Armistice’ Day, the day the Great War ended, to express the hope that wars are no longer necessary or productive and that peace should prevail? Where else might one hope to meet others who share the view that the best way to honour the war dead is by bringing war itself to an end? However, based on experience, I must now conclude that, in the eyes of some, expressing a wish for peace on Remembrance or ‘Armistice’ Day is tantamount to criminal. 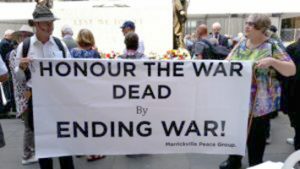 Last year (on November 11th, 2017) members of Marrickville Peace Group (MPG) displayed a banner reading “Honour the War Dead by Ending War!” at the Cenotaph. Expressing such a sentiment was severely frowned upon by those within or close to Australia’s military community who were at the ceremony. What was considered a slogan of sound, common sense clearly did not resonate with them. I was told that I was a coward, a disgrace to my country, a despicable human being and a traitor who should be ashamed of himself. Needless to say, I am not ashamed of myself. It is extraordinary that seeking a peaceful world created such strong (almost violent) animosity in response. For sure, there is a certain segment of the community who glorify war and subscribe to poet Wilfred Owen’s “Old Lie” – Dulce at decorum est, pro patria mori (It is sweet and proper to die for one’s country). This segment would welcome the perpetuation of war. However, theirs is not the only way to remember and honour the fallen. There are better ways to do so. This year, the centenary of the Armistice of 1918, the ceremony was held at the War Memorial in Hyde Park. Members of MPG had agreed that their banner of the previous year might have been ‘out of step’ with the tone of the event. However, we still felt the need to display how we choose to honour the war dead, so we carried small placards, hung around our necks, bearing the same slogan – “Honour the War Dead by Ending War! We handed out 500 flyers with a message of peace. After the previous year’s experience we had anticipated encountering some objection to what we were doing and what we stand for. As expected, we were admonished to do what we were doing elsewhere. However, we stuck to our plan and held our ground. Members of MPG are individually of strong character, but at this event we were a small and scattered group – a very small part of a very large crowd. In trying to make contact with others in our group, I moved from the Western to the Eastern side of the Pool of Reflection. There I found myself separated from my colleagues. I was approached by two NSW police officers and told that I was on War Memorial Land. I took this to mean that distributing our flyers was not permitted there, and was content to comply (if somewhat reluctant). The exact boundary-line of that land was shown to me. I gave away my remaining flyers in the crowd around the memorial, without being on ‘War Memorial Land’. I then returned and did stand on this land. When I did so, the same two police officers came and told me that I was committing trespass. I looked at the crowd around me in disbelief. Out of the entire crowd of thousands, it was myself alone who was a ‘trespasser’. I do not remember all the details of the conversation I had with the officers, but I do recall being told that the War Memorial authorities had indicated that I, and I alone, was a trespasser – and that what I had been doing was ‘upsetting some people’. There was no point in my arguing that advocating peace on an occasion like Armistice Day should cause upset to no-one other that those who find violence preferable to peace. Nor did I understand how I could be a ‘trespasser’, when countless thousands in the same place as me were not. I was told to take two steps back, to put myself the other side the ‘boundary-line’ – but the ridiculous nature of that instruction made me decide to put it to the test. Would I really be arrested for trespass, aged 71, in a white shirt, wearing my veteran father’s regimental tie, with a placard around my neck bearing the words “Honour the War Dead”, on Remembrance Day? Would I really be dragged off for this ‘crime’? I decided to stand my ground and not step back. For an elderly person, there is something extremely undignified about being hauled out of a crowd by two burly blokes in blue, one grasping each arm. I did not enjoy the experience at all – nor did I deserve the humiliation I felt. Once outside the Hyde Park precincts, there was a change. I was not to be charged with trespass, instead I was asked to comply with a police directive not to enter Hyde Park for six hours. I agreed to this. I had had enough. I could see no point in taking the matter further. Had they stuck to the original plan of charging me with trespass, it might have made for an amusing time in Court. As it was, the police had done what was intended (at whose behest, one might wonder?) and got me, evidently a source of embarrassment to some influential party, off the premises and out of sight. ‘Authority’ had prevailed. From ‘their’ point of view my removal was an objective achieved. I know that I committed no crime. I know that I was actively prevented from honouring the war dead in the way my colleagues and I choose to do that. I am utterly perplexed that ‘the authorities’ felt the need to criminalise giving expression to the idea of peace. If ‘they’ had sufficient sense, they could incorporate proponents of peace into the event. They might, for example, invite a representative of the peace movement to lay a wreath. Is there no space in the ceremony for those who honour and respect the fallen, who also advocate stopping the senseless slaughter of warfare? If there is not, then Remembrance Day plays into the hands of those who would describe it as nothing more than a celebration of war-making. My individual experience is of no consequence, but the implications behind it are. I was removed because of what I was doing. What I was doing was expressing the view that the best way to honour the war dead is by ending war. It is an extremely simple and logical proposition. Yet, through some perversion of rational thought, this proposition comes under deep suspicion from Australia’s military establishment. Judging by the response, it must be seriously threatening. So entrenched is the idea of war that one could be forgiven for feeling that there is actual fear of an outbreak of peace. As things stand, the establishment tolerates no visible expression of the need for peace and will countenance no discussion of anything other than war. Following my 2017 experience I attempted to engage the RSL (guardians of the Cenotaph) in discussion. My position was not taken seriously, in that I received no direct response to my question of whether or not it is appropriate to advocate peace on Armistice Day. I seriously doubt that the War Memorial will enter into any dialogue about the matter, either. So far from talking about peace, the military establishment will not even discuss talking about it.